Yesterday I had a doctor’s appointment so I couldn’t go to the museum to sketch. 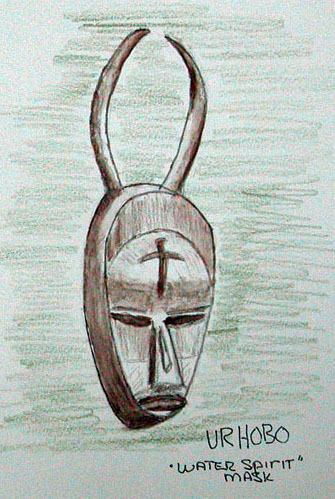 This, however, didn’t prevent me from sketching, but it did force me to mentally shift gears a bit. 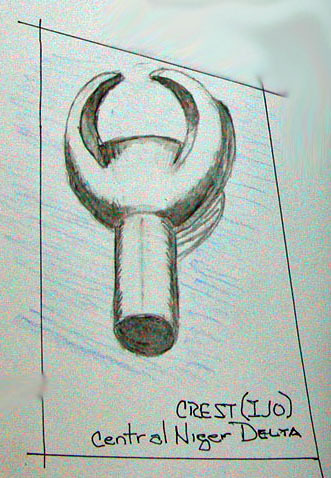 I’m a sketcher who enjoys sketching precisely, or I try to achieve some precision in my sketches. I like my sketches to reflect what I’m sketching, without a lot of loose and/or restated lines, casual approach to outline, etc. Depending on your view this is a good or bad thing and I’m not here to defend my approach; it’s just how my brain works. In point of fact, I’d like to do both loose and precise sketching but as a relatively new sketcher, sketching slowly fits my limited ability to truly ‘see’ and depict what I see. Anyways, yesterday I got to the doctor’s office (he works out of a clinic) and I had to wait. Those of us waiting sit, while others stand in a short line, waiting to tell the receptionist about their own appointments. There’s not much to sketch, at least that sits still for any period of time. There is, however, a 20-30 second period of time where each of the patients is standing in front of the receptionist and I had a clear view of them. So, I took out my S&B 4×6 sketchbook, my Pilot Prera, and I started quick sketching the people as they took their turn at the receptionist’s window. I did several of them before the doctor, all too soon, called my name. It was fun. This is what those 30 second sketches look like. Not much to speak of but satisfying in some strange way. 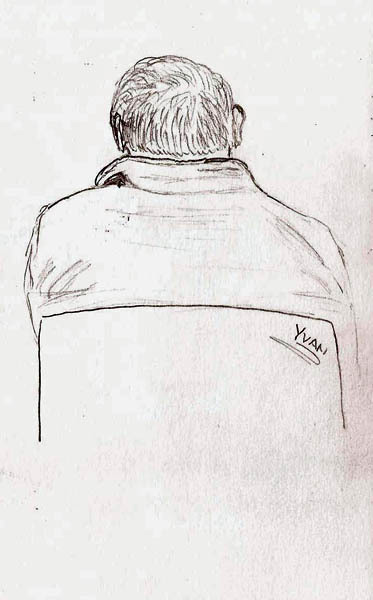 The second sketch is one in which I spent an extra 30 seconds, after the patient had left, adding some rough shading and darkening some outlines. More fun. 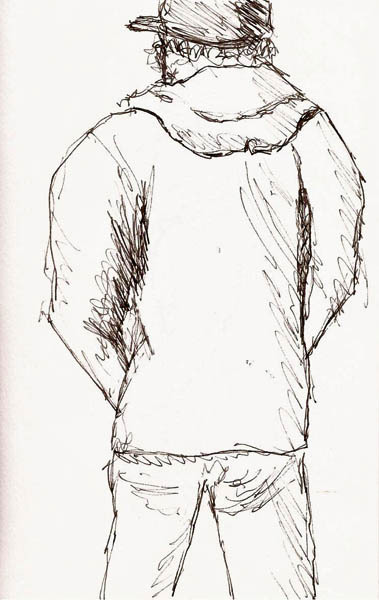 I should add that I’ve been critical of the many books and drawing courses that advocate students begin sketching by doing ‘gesture sketches’, which these most certainly are. A year ago, as a new sketcher, there is no way I could have done even these crude sketches in this short time frame. If you’re a newbie sketcher you know what I mean. Thus, while this was/is fun, I remain skeptical that it’s where you want to start as a sketcher. I’m reminded of something my buddy Yvan has said to me several times. “You must draw slowly before you can draw quickly.” I think he’s right and the how-to-draw books could learn much from Yvan. I still can’t draw people well, whether I draw slowly or quickly. But because I’ve drawn a bunch of them slowly, and because I’ve studied (watched a lot) people, I’ve got a better idea of what I’ve got to capture when I’ve only got a few seconds to do so. I have to say that I had a lot of fun in those few minutes in the doctor’s office and I hope I can improve my abilities to capture people quickly. I still like my slow, and I do mean REALLY slow, sketching approach, but sketching quickly is fun too. I feel there’s room for both in my life. What do you think about quick sketching? 2012 represents most of my sketching experience to date. 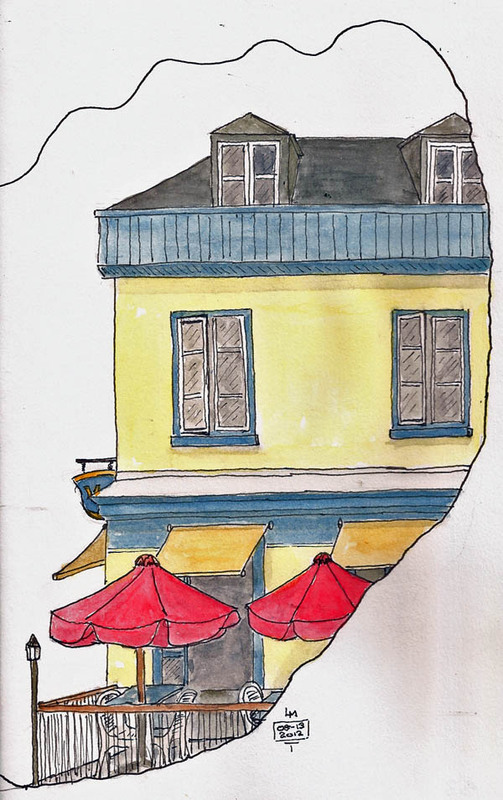 I started trying to draw cubes back in September of 2011 but I didn’t start doing any location sketching until spring of 2012 as the Quebec snow melted. It’s been a fantastic journey as I’ve climbed the early stages of the sketching learning curve. I thought it might be fun to do a ‘ 10 favorites’ post, where I present what I think are some of my best sketches of the year. I’m often accused of being ‘down’ on my sketches. Here’s my chance to show people that I’m actually happy with some of them (grin). Because 90% or more of my sketches have been done on the street and most have been buildings, I thought I should vary my choices by selecting one sketch from ten different categories, just to increase the variety. So, here they are. I hope you like them. This is, by far, the hardest selection. I’ve done a LOT of building sketches and none of them really stand out as extraordinary, though many are personal ‘favorites’. I’ve chosen this one because it, in the extreme, is the brightest (grin). I’ve drawn a number of cars, trucks and even heavy equipment. I chose this one, however, because the subject was so darn cute when it found it lounging in the old port area of Quebec. Pete Scully, by example, caused me to notice and sketch fire hydrants. 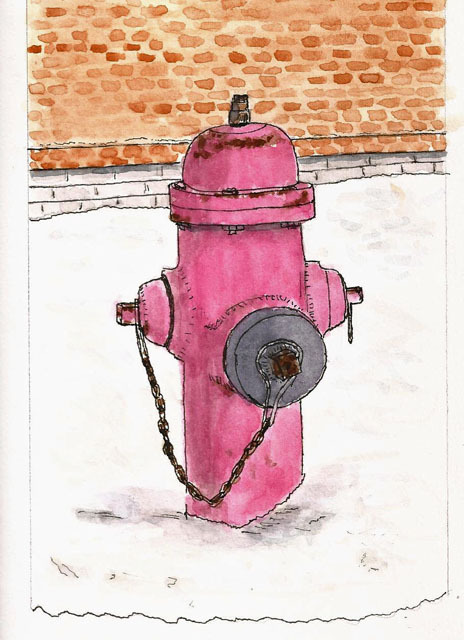 I don’t know what it is about them but once you start looking at them you realize they vary considerably and that fire hydrants have oodles of personality. I chose this one because I like the composition. I’ve tried drawing from photos and it’s ‘ok’ but sketching, for me, is about going places and seeing things. But winter in Quebec City is just too cold to be outdoors so we’re all driven indoors. At first I found that depressing but once I saw the Samurai exhibit at our museum of civilization, I was hooked on indoor sketching. 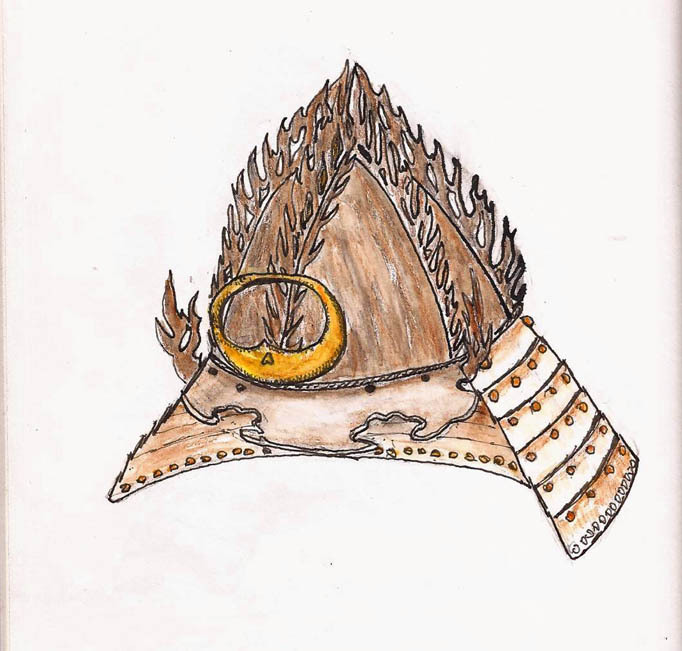 I started sketching Samurai helmets, which are amazing, serving to protect heads as well as indicate status, identity, and even to serve in ceremonial roles. 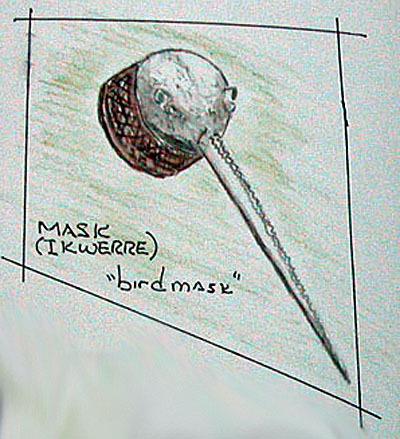 It’s hard to choose a single helmet sketch as I love these amazing pieces of hardware. I chose this one as it nearly drove me nuts drawing all those flame thingies. This was hard as I haven’t drawn many people. It’s on my ‘to do’ list for 2013. 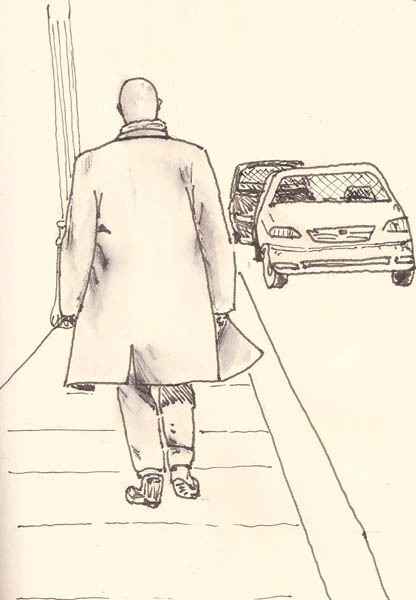 But I chose this one, a very simple sketch, because I liked the way I was lucky enough to capture the movement of this guy’s coat as he walked along. 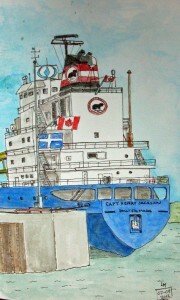 Quebec City has an active port so I’ve sketched several ships. I chose this one because I remember struggling with all the decks and railings. I also have memories of how much fun I had that day as I sketched with my buddy Pierre. Quebec City is heavily populated by domes and steeples projecting upward from their supporting structures. I love sketching them and have done a bunch of them. I chose this particular sketch because it features both domes and steeples in a single sketch. 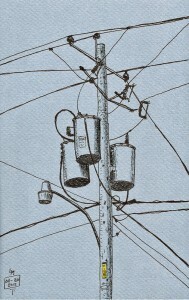 Maybe you have to be an urban sketcher to appreciate them, but I like telephone poles and all the wires, transformers and connectors that hang from them. I did this sketch on blue paper and liked the way it turned out. I’ve drawn a bunch of trees but mostly they’ve been ‘studies’ where it was just the tree and nothing for supporting material. 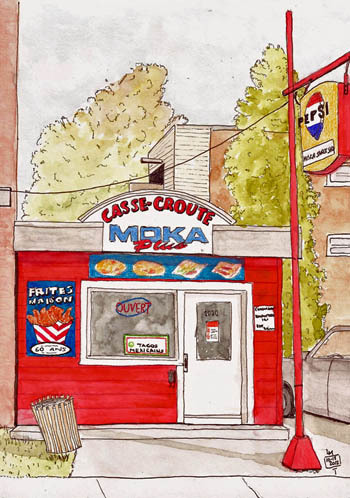 This one, however, was done one day when Pierre and I headed out one Sunday morning looking for things to sketch. It was a crisp autumn day and the maples had started to change colors. I decided to make the tree the main attraction, putting the building in the background. To fulfill my promise of ten sketches, I’ve added this vignette to complete the set. I was sketching with my friend Nicolas and we were sitting in a church yard, a church that has become a library. 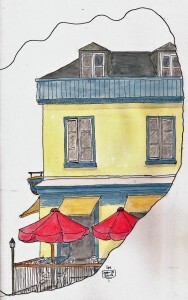 I looked over my shoulder and could see part of this restaurant, liked the red umbrellas and so I drew it. Again, it brings back memories of a good day. I’m looking forward to 2013 sketching. For a while I’m going to have to work indoors but sometime around April we’ll start having a day or three where it’s tolerable to sketch outside and you’ll find me on the streets all summer. Happy New Year, everyone. The last few days have been stormy here. High winds, snow, and general ugliness. No big deal except that I haven’t been able to follow my normal walking regime. 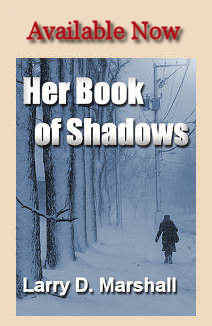 With mild desperation to right that wrong, I trudged off today, or rather I was slipping and sliding down the sidewalks. I was jumping mounds of snow, walking on water…well, really just in it. After an hour of this joyous adventure I found myself at the Musee de la Civilisations, my winter haunt. I sketched only one Samurai helmet today, though. This one was a bit more challenging, with all its fire ornamentation and besides, I had another hour of slipping and sliding to get home. It was fun anyways and while I’m beat from the walk, it was a very satisfying day. I think, though, that I’m going to sit and sketch for a while. 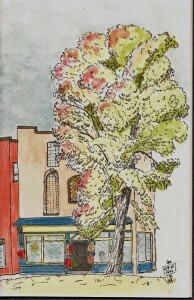 The sketch was done in a Stillman & Birn Alpha (5.5×8.5), which is becoming my museum sketchbook. I used a Pilot Prera and Lex Gray. The color comes from Faber-Castell “Albrecht Durer” watercolor pencils, mushed around with a waterbrush. This is an approach that fits the museum world and works for me, though I’m still learning how and what to do with them. 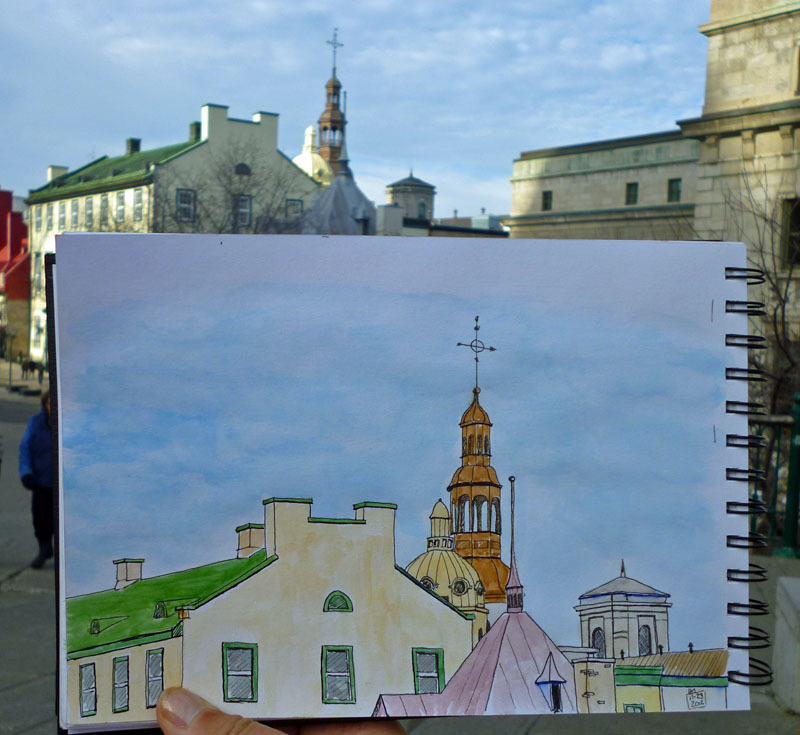 Samourai Sketching in Quebec – Urban Sketching? 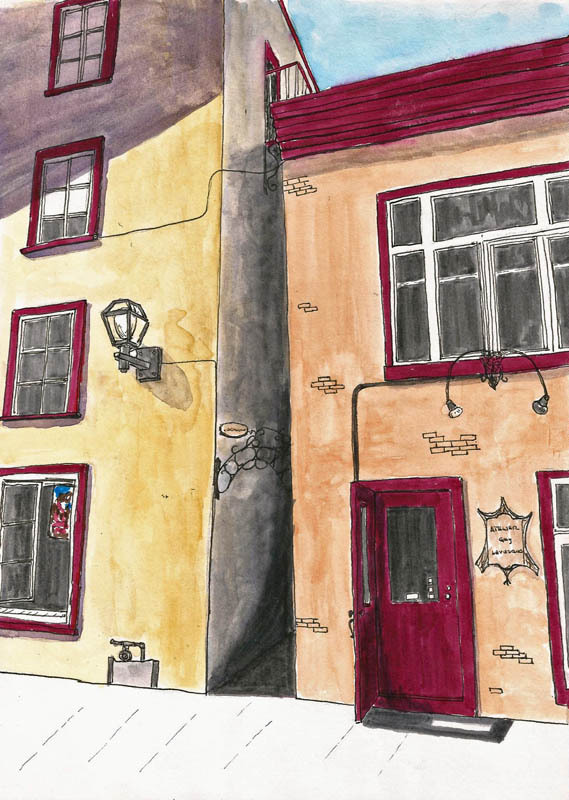 The Urban Sketcher’s ‘manifesto’ is quite clear: “We draw on location, indoors or out, capturing what we see from direct observation.” I’m a diehard location sketcher. 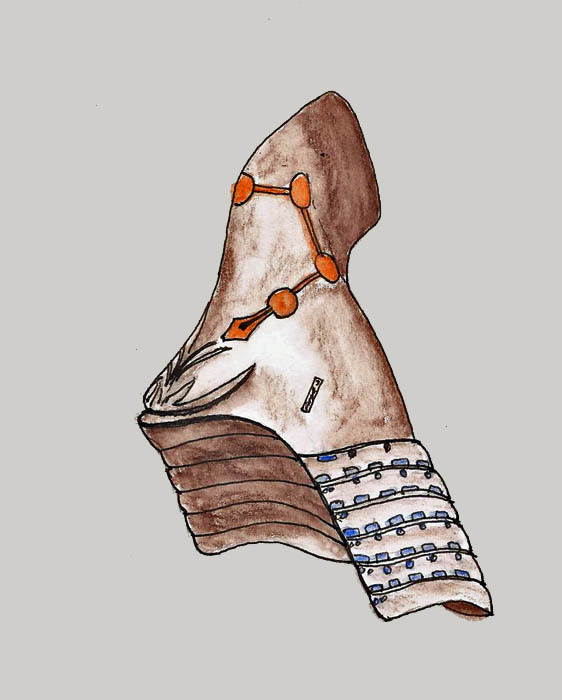 I do sometimes sketch from photos or just doodle from things my two functional neurons cough up. But I can’t really get into that sort of thing very much. 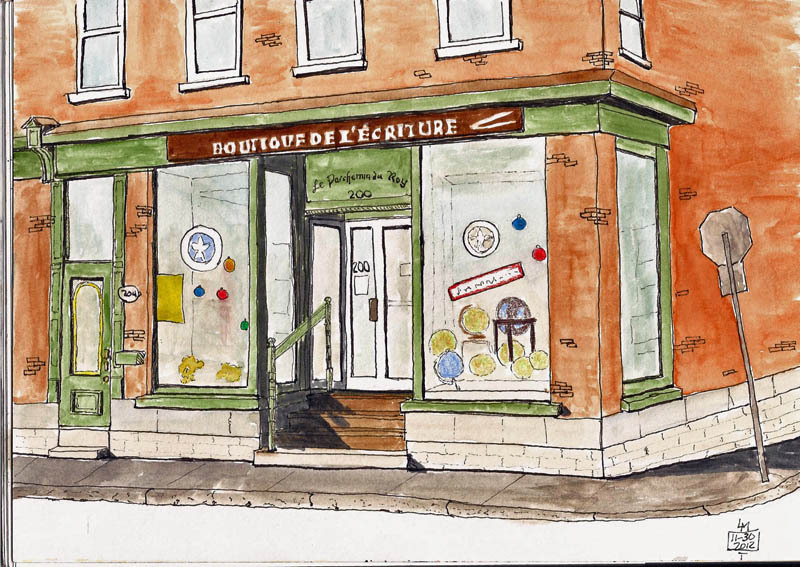 I like to draw buildings, fire hydrants, telephone poles, trashcans and vehicles, but this time of year, outdoors is inhospitable in Quebec City, at least for an Arizona cowboy like myself. For example, it’s currently 24F (-5C) with 35kmh winds just for good measure. So, the things I have available to sketch for the next few months are going to be indoors. One of my favorite places is the Musee de la Civilisation here in Quebec. Nice ambiance, lots of things to sketch, and it’s warm. The people are also very friendly towards sketchers, which puts one at ease. So, you’ll see lots of museum sketches from me this winter. And here are a couple more. I went to the museum last Sunday with three of my sketching buddies and we had a great time. As we were there in the morning I decided to give the Samourai exhibit my attention. Often it’s just too busy to sketch there as it’s the current ‘feature’ display, but on Sunday mornings there aren’t a lot of visitors. Koshozan sujibachi kabuto (1588) – This is a very rare piece, constructed with 120, riveted plates. 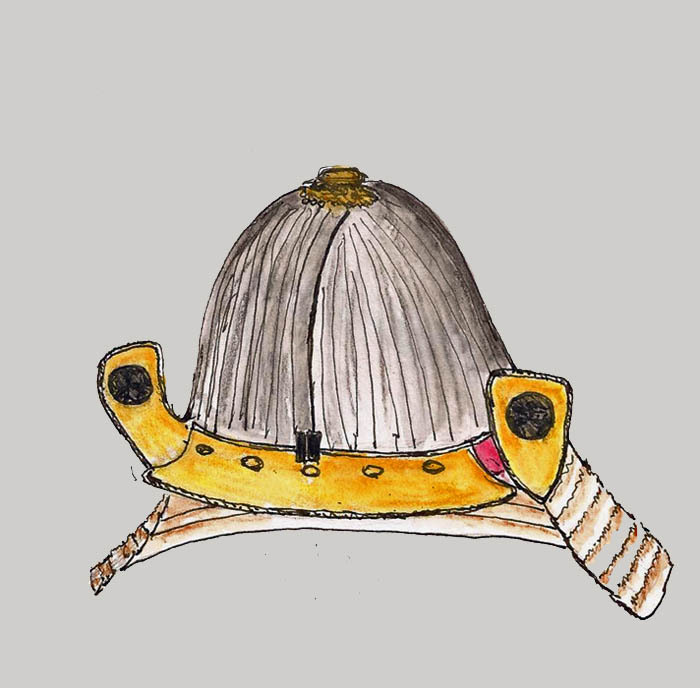 It bears the crest of the Inabi family, a very influential family of the 16th Century. It is a dark room, with most of the Samourai armor in lighted glass cases. Sketching in the dark is an interesting challenge and more than once I had to walk to a light to see if I was doing ok with the sketch. I’ve got to get a little clip-on light I guess. These little excursions became more frequent when I was trying to figure out whether the watercolor pencil was red, orange or brown (grin). Nagaeboshinari kabuto (Edo 17th Century) – This appears to be hammered bronze. It features the Big Dipper constellation inset into the metalwork. These helmets were done in a Stillman & Birn Epsilon series sketchbook (5.5×8.5) using a Pilot Prera and Noodler’s Lex Gray ink. I have a handful of Faber-Castell watercolor pencils that I used to color them. I’m guessing but I think I only have 30 or so more helmets to sketch. Then I can move on to the rest of the armor, the weapons, the guys on horses. It’s going to be a fun, long winter. Where do you find your sketching inspiration during winter? 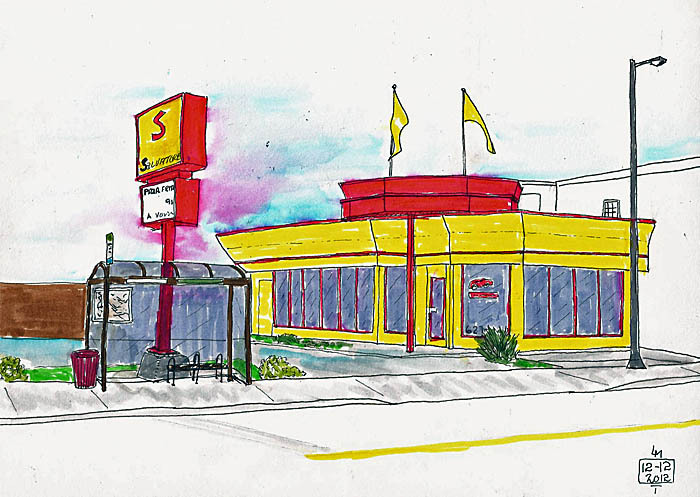 Yesterday I had a lunch appointment and as I walked home from it I passed a bright yellow pizza place. Have you ever done anything goofy for a goofy reason? Maybe I’m alone in that combination. 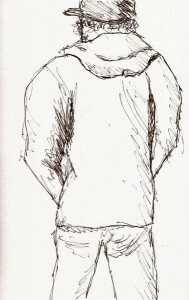 It occurred to me that it was 12/12/12, a rather unique date and that I should sketch something. But, this was one of the odd times when I didn’t have my sketching stuff with me. Besides it was cold. Still, as I continued walking I couldn’t get the pizza parlor out of my mind. By the time I got home, all sense of rationality had left me. “It’s only 10 minutes back to that place,” I said to myself. “I’ll work fast and it’s not really that cold.” I grabbed my sketching bag, threw half a dozen Tombow markers that I thought would I’d need into the bag along with a waterbrush. Off I went. It was nuts and I’ve never sketched a building so fast. It’s certainly not my best sketch and somewhat wonky. I used the Tombow pens to color it at lightning speed. and then got out the waterbrush to add some sky color by wicking color from a Tombow pen onto the waterbrush. I made a mistake and swiped some red from the sign into my sky. I liked this little “happy mistake” so I did it some more. This adds to the wonkiness of my 12/12/12 sketch but I liked it. I liked it better, though, when I got home and got a cup of hot tea in my hands. It’s definitely too cold for me to sketch outdoors anymore this year. 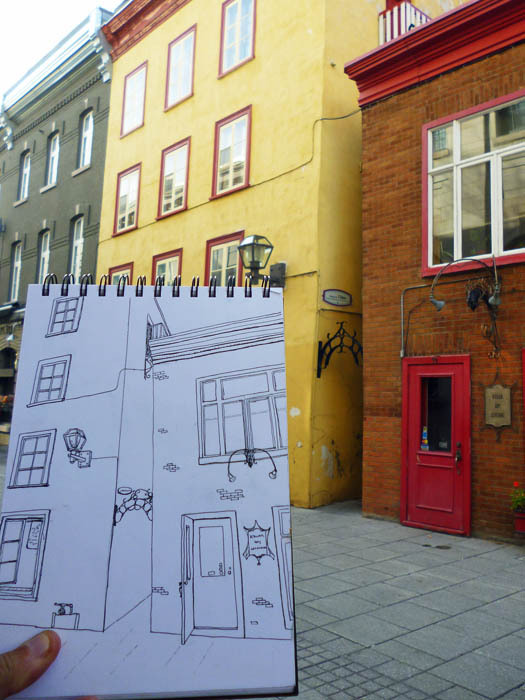 Have you done anything this crazy in the name of sketching? 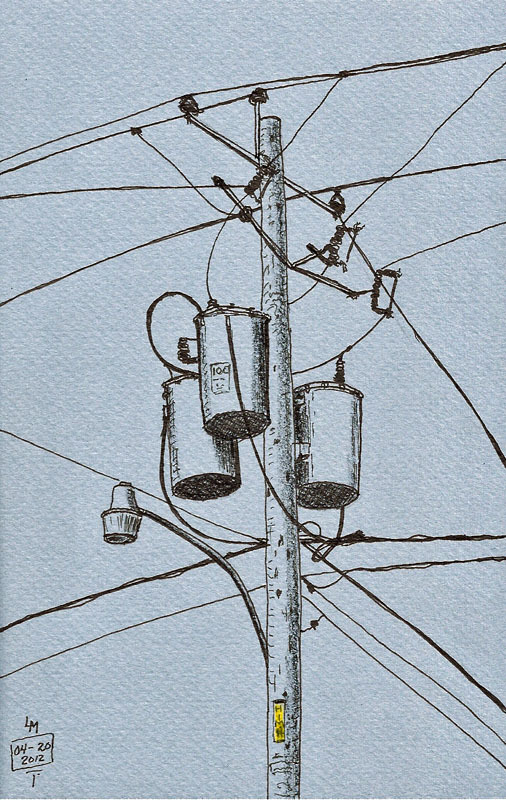 The sketch was done in a Stillman & Birn Alpha (10×7) sketchbooks, using a Kaweco Classic Sport (fine) and Noodler’s Lexington Gray ink. As mentioned, Tombow pens were used for color. I was talking to a sketching buddy and he asked “Do you know about Parchemin du Roy?” I said no and he told me about a place that sold pens, sketchbooks, and pencils that he’d recently discovered. To say my interest was peaked was an understatement. That was a Sunday. And so on Monday I hoofed my way to Parchemin du Roy, about a one-hour walk from my house. They were closed, so like a kid in front of the toy shop, all I could do was put my nose to the glass and look in. And what a view. I left with the resolve to return. And so I did. It’s not very manly to jump up and down while giggling so I controlled myself, almost, as my eyes beheld the interior of this store. Inks, pens, books, papers, sketchbooks, notebooks, maps, pencils, watercolors, brushes, and lots of other wonderful items to look at and touch. Maybe more important, is that while they have the more typical Paper Blanks, Moleskine, and Rhodia products, they also have some really nice high-end speciality paper products. Not only do they have J.Herbin and Pilot/Namiki inks, they’ve got walnut inks and specialized calligraphy inks. In addition to Brause dip pens, they’ve got handmade dip pens turned from hardwoods. While they stock Lamy pens and all their accessories, they also have the new Shaeffer “Ferrari” pen. Yes, I admit it. I did giggle and I jumped up and down a little. I hope Roy didn’t see me. They offer workshops in calligraphy and you can learn to create illuminated pages. I might have to take one of those. For my first visit I bought a brush, notepad and mechanical pencil. I talked with Roy about differences between Parker and Waterman ballpoint cartridges and I looked and looked – and then I looked some more. I’m still a bit giddy from the experience. As I left I took a couple photos (it was too cold to sketch outdoors) and ran home to do the sketch I’ve shared above. I hope you like it. 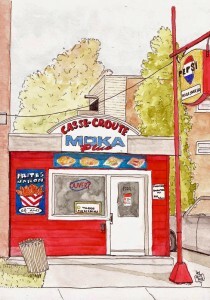 Do you have a specialty store like this in your town? I’m so lucky. 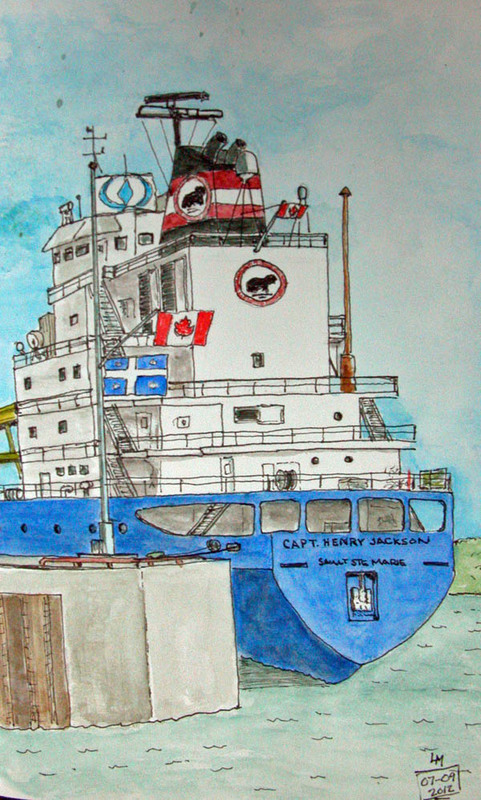 A couple weeks ago I was down at the Quebec City port and parked near the Louis Jolliet excursion boat dock sat a great little car, painted up as a race car. I don’t know if it was really a race car or why it was parked there. But I plucked my camera from my sketching bag and took a photo of it. Yesterday I couldn’t go out sketching and I remembered that car. I brought the photo of it up on my computer and I sketched it. 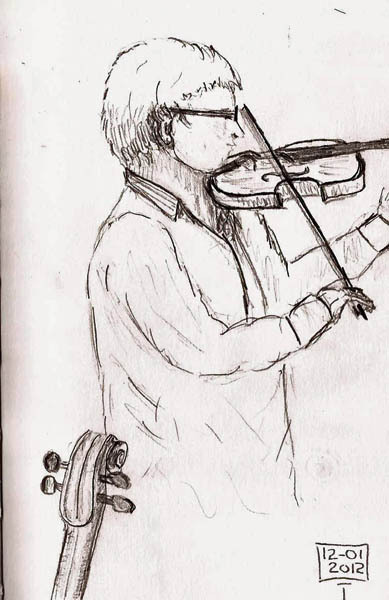 Though I’m not an accomplished sketcher, I have to say that I like the sketch better than the photo. Just a bit more personal I suppose, and now I know this car better than my own. Ain’t she cute? 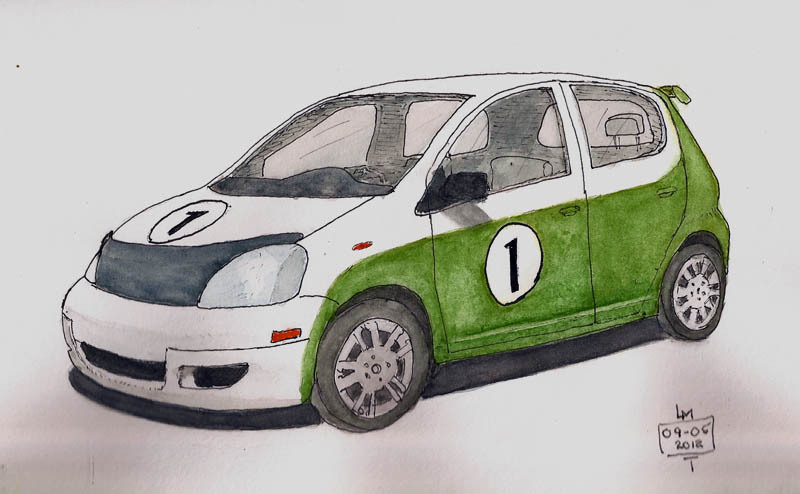 Are cars the ultimate ‘urban sketch’?